Apartment was clean, and very much resembled the pictures on the site. I was fully equipped with everything one might need for a few days stay in Budapest. The wine bar right next to the apartment is a MUST! Knowledgeable staff, free tasting, fare pricing - pick up your Hungarian wine and get to know that (less known) part of the culture! The responsiveness of the staff was exceptional. I had read a couple of reviews which mentioned problems accessing keys. We were well informed prior to a late arrival and had no problem at all. Just can’t believe how friendly and effective the service was. First trip to Budapest and I will return and I have already recommended this place to friends. Fantastic Location! (Kazinczy 52) The service at the office was OUTSTANDING! The staff are polite, pleasant and made an effort to help make us comfortable and happy! The apartments are well equipped and spacious. Good location. Nice facilities. Staff went out of their way to make our Christmas more comfortable. They made some toys available to us for our 3-year old son. Very nice touch. Great location, lots of space for the 5 adults and 5 kids we traveled with. Very helpful and friendly staff! Would definitely recommend and/or stay again! The staff was very very nice! The apartment is beautiful and the best location in Budapest. Location was very good and the apartment was spacious.The kitchen was well equipped and the living and dining areas were large.The bedrooms were a good size and we were given a plentiful supply of towels. location was good., near to shops. restaurants, etc. rooms, bed, kitchen and spaces were excellent. comfortable place. I will come back here. Location was amazing, right in the heart and 2mins from one of the main Ruin Bars. Lock in a great price for Central Downtown Apartments – rated 9 by recent guests! Central Downtown Apartments This rating is a reflection of how the property compares to the industry standard when it comes to price, facilities and services available. It's based on a self-evaluation by the property. Use this rating to help choose your stay! One of our top picks in Budapest.Featuring free WiFi and air conditioning, Central Downtown Apartments is located in Budapest, within 0.6 mi of St. Stephen's Basilica. Private parking is available on site. All units feature a flat-screen TV. Some units include a terrace and/or balcony. All units have a kitchen fitted with a dishwasher and oven. A microwave and coffee machine are also featured. Each unit is equipped with a private bathroom with a hairdryer. Bed linen is available. Central Downtown Apartments are within 0.6 mi of Dohany Street Synagogue and the Váci Street shopping area. The nearest airport is Budapest Liszt Ferenc Airport, 11 mi from the properties. 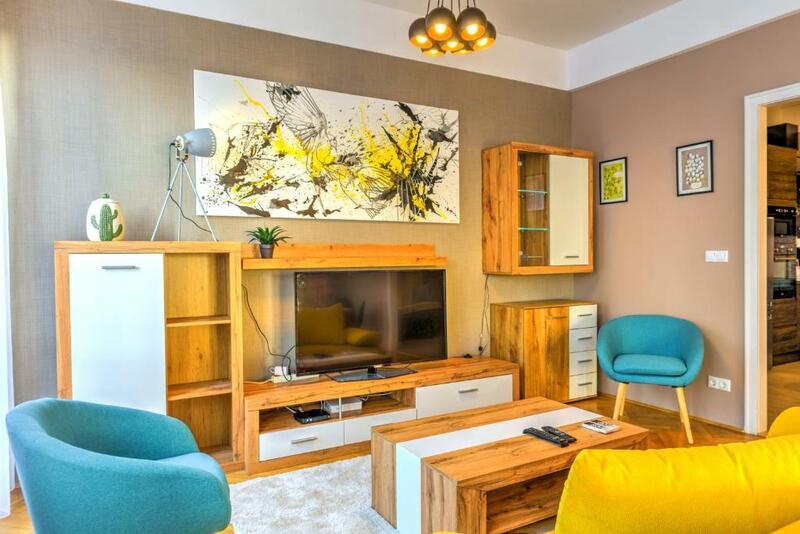 뀐 Located in the real heart of Budapest, this property has an excellent location score of 9.5! When would you like to stay at Central Downtown Apartments? This apartment is located in a modern building. It features an open plan living room, 3 bedrooms, 2 private bathrooms with tub/shower as well as an additional guest toilet. The apartment offers excellent public transport connections. Parking is available in the building's underground car park for EUR 15/day. This apartment is located on the 5th floor. It features a living room, dining room as well as a fully-equipped kitchen. There are 3 bedrooms, 2 private bathrooms and an additional guest toilet. The apartment includes a balcony as well as access to two rooftop terraces with hot tub and kitchen facilities. The unit is just a few minutes' walk from the Dohány Street Synagogue. This modern apartment is located on the 2nd floor and there is an elevator. It features a living room with sofa bed, dining room as well as a fully-equipped kitchen. There are 3 bedrooms, 2 private bathrooms with tub/shower and an additional guest toilet. Hot tub and kitchen facilities are there. The unit is just a few minutes' walk from the Váci Street shopping area as well as from the Opera and Andrássy Avenue. This modern apartment is located on the 2nd floor and there is an elevator. It features a living area and a kitchen, 2 bedrooms, a private bathroom and an additional guest toilet. The apartment offers a balcony. This spacious, air-conditioned apartment is located in a classical style building. It features a fully-equipped kitchen a living area with LCD TV, 3 bedrooms, 2 private bathrooms with tub/shower as well as an additional guest toilet. The apartment also has a balcony. The apartment offers excellent public transport connections. This apartment has a microwave, cable TV and air conditioning. Rooms are 179 square yards. This apartment has a kitchen, washing machine and stovetop. We have several apartments at different locations. Please check the name of the apartment to get your exact address! Our apartments are located only in the center of Budapest, everything is in walking distance. Many restaurants, cafes and pubs in surrounding area can be reached by walk. In the center of the downtown there are lots of changes and shops as well. House Rules Central Downtown Apartments takes special requests – add in the next step! Central Downtown Apartments accepts these cards and reserves the right to temporarily hold an amount prior to arrival. Please note that cash payment is possible in both HUF and EUR. A damage deposit is required upon arrival and can only be provided by credit card pre-authorization. This deposit is fully refundable upon check-out as long as there has been no damage done to the property. Please note that the apartments are at different locations in the center of Budapest. For further details contact the property in advance. Contact information is provided in the confirmation email. Please note that hen, stag and other parties cannot be accommodated. In case of booking more than 3 rooms, or when booking for 10 or more people, different policies may apply. Please note that check-in and key collection take place at: Szekely Mihaly utca 3, Budapest 1061. Please inform Central Downtown Apartments of your expected arrival time in advance. You can use the Special Requests box when booking, or contact the property directly using the contact details in your confirmation. Two of the blankets had something dirty on them, and there was missing some towels or bathroom carpet for the floor in the bathroom, so you can stand in after the shower. To register you need to go to office and sign papers. Nothing. We were pleased with the accommodation as we had been given a bigger apartment than the one we had booked.The extra showers and bathrooms were an added bonus.The location was really good and we managed to see a lot.of interesting places. elevator is old, not good. parking place was at ~200m distance. It was a little bit hard to find the office. Really a good place. Near to everything. Perfect location. The property was in a fabulous location in the heart of the Jewish District and perfectly placed for access to the city. It was also spacious and very clean. Location, room was clean, tidy and spacious. There was no soap in one bathroom and no warm water at shower. The location was excellent, the beds were comfortable, very clean apartment and big enough for 3-4 families. Closeness to the bars can result in hearing beats in the night - could be a problem for people with light sleep. Very nice service, office is located right near the flat and ready to assist you with any questions. Perfect location - all sights are 10-15 min walk, ruined bars for the night are just around the corner. Conditions are quite comfortable and have everything needed for stay. Cleaning needs improvement, Also it doesn't offer some normal amenities like shampoo and body wash. The location is a little bit noisy but I suppose that can be expected for such a central location. Location is very good, very central; the apartment is very spacious offering 2 separate bedrooms and one leaving room (for up to 8 people). Parking, even if you need to pay some extra, is a plus as you have your own place.